Catalonia European Region of Gastronomy 2016 will send culinary student Eric Díaz to the European Young Chef Award 2018. This year’s addition is hosted by Galway-Mayo Institute of Technology, GMIT, on 26 November 2018. Eric grew up in his hometown of Abrera, in Catalonia, Spain. Abrera is a small Catalan town located just northwest of Barcelona and near the base of the famous Montserrat mountain. He has lived there since he was 7 years old and has been able to enjoy traditional Catalan cuisine and local products that the area has to offer for many years. His initial inspiration to become a chef came from an unpredictable time in life where he was neither studying or working. During that stage of life, he took advantage of a local culinary course offered by the city hall and started cooking most of the meals at home. It was from that moment that he realised he wanted to become a chef. Nowadays Eric is studying a High Degree in Kitchen Management and currently working in a local restaurant, Cal Duran. Eric is focusing on his education and learning to be able to better determine the future of his career. That being said Eric’s short term goal is to finish his studies and his long term goal is to travel the world and learn from the many unique cuisines abroad. 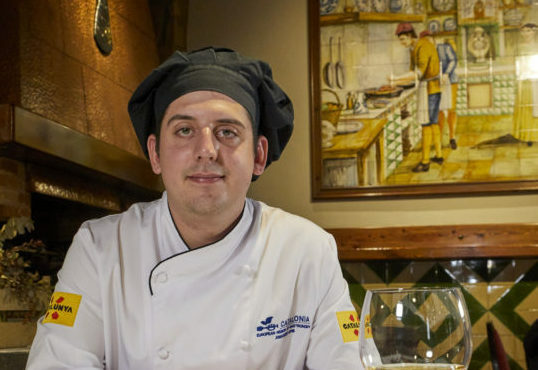 Winning the Hotel School St. Pol de Mar, EUHT StPol, culinary competition and having the opporuntity to represent Catalonia in the European Young Chef Award 2018 has made him see his career from another point of view.